I have a concept I call the credibility pyramid. 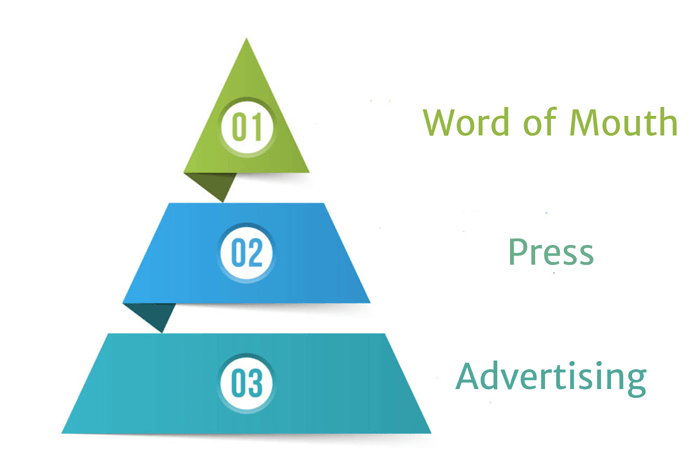 At the bottom of the pyramid is advertising. What you say about yourself and your company is self-serving. It raises skeptical flags. The next level up on the credibility pyramid is the press. What’s written about you in the press is more credible than advertising. Even when the press has misquoted me, the benefits have been tremendous. At the top of the credibility pyramid, what your friends and trusted business colleagues say, is just about the absolute truth in your mind. There are a couple of techniques to generate catering referrals. The first is to ask. We’ll talk about that shortly. Being a big believer in systems, I believe you should create a marketing system to regularly solicit catering referrals from your clients. Any time you can put a marketing system on autopilot, your time is freed up to pursue other money-making and money-saving activities. 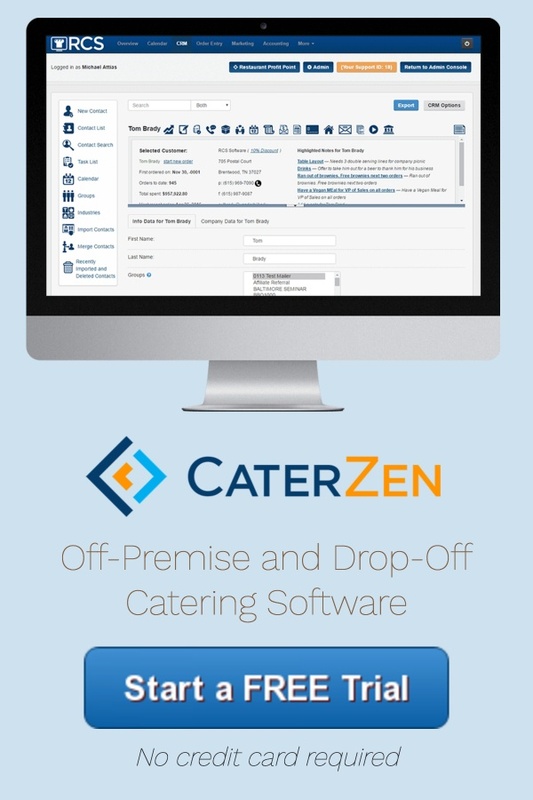 Our catering software, CaterZen, can be configured to mail out marketing letters for you like our loyalty and referral program. We work with you to select criteria to best reach your marketing goals. We actually print the letter in full color, fold it, stuff it, seal it, address it, and put postage on it. It gets out the door without you lifting a finger. Below is a copy of our loyalty club welcome letter. All of your marketing letters come with a custom letterhead image, graphics and your signature. 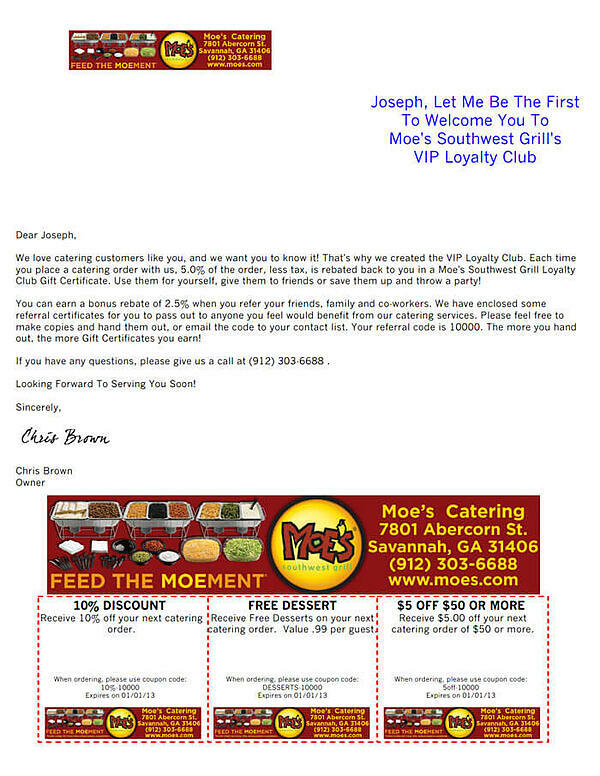 The purpose of this particular letter is to welcome one of your catering clients to your loyalty and referral club. Let’s focus on the referral components of this system. Part of the benefits of the loyalty club is earning gift certificates when a catering purchase is made. We’ve taken the loyalty club and put it on steroids. It’s modeled on the old MCI Friends & Family plan. When the referral uses the offers, they get a special deal on their first catering order with you. Each offer has a tracking code key connected to the person making the referral. This makes sure they get credit for all future referred sales. By rewarding a referral, you increase your referral activity. 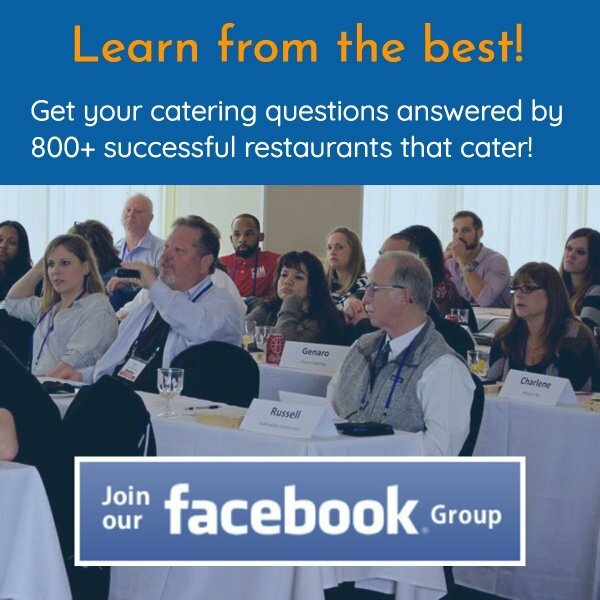 I recommend sending out a referral-type promotion to your catering clients quarterly. Now let’s talk about a more direct way to get referrals. Ask. The thought of asking your best catering clients for a referral can be daunting to some of you reading this article. Whether it’s over the phone or in person, directly asking for referrals is a no-brainer. This script above is what I would describe as the weakest referral strategy. If you have any friends or family members who are realtors, they love to use this line. As if I’m going to remember that you asked me to give you a referral. Asking someone to jog their memory is a tall task. My friend and consultant Hank taught me a neat way to get referrals. Create a list of companies you’d love to have as catering clients. Set up a meeting with your best clients. I would bring in a free meal or dessert tray to the meeting. “Sue, I’m always looking to grow our catering business, and we are trying to find more great catering clients like you. I have put together a list of some companies here in Nashville we would love to work with. Want To Make Some Easy Cash Yourself? Now I wouldn’t be doing my job as a business owner and educator if I didn’t ask you for a referral. We are trying to find great clients for our catering software and we’re launching a referral program that rewards everyone. Sign up to be a referral partner for us here. When you do, you’ll be given a special tracking link to send out to anyone who may be a good fit. You can also post it to Facebook, Twitter and LinkedIn. If they become a client of ours, we will send you $250! In closing, referrals are a great way to grow your sales. Here’s to both of us crushing it in 2019 with the power of referrals! 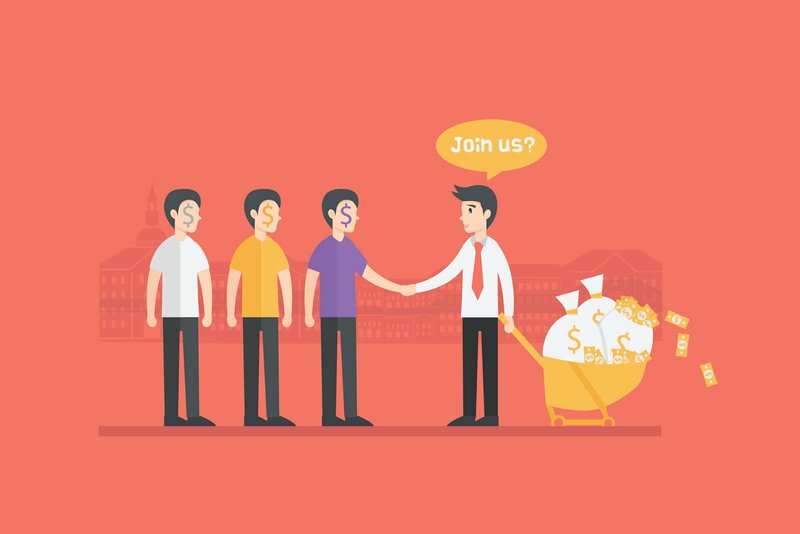 Have you had success with referral marketing? Let us know in the comments!